"I had ridden at Jake a time or two and actually was there to ride when the January workday was going on. My husband and I first went there about 5 or 6 years ago to train for endurance rides and I was not impressed with the trail system so I hadn't gone back until last November with a friend who lives close and had never been there. I was pleasantly surprised to see how much improvement there has been and am itching to get back there and ride if the dumb rain/cold will stop!!! 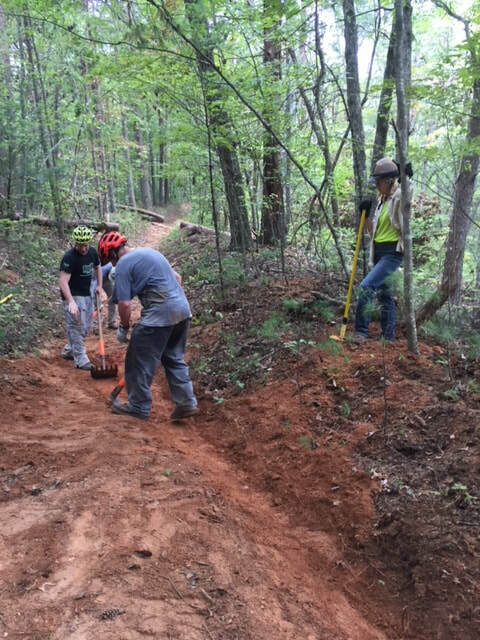 Thanks to all of you and I will be so glad to help maintain what have become some really nice trails." Everyone including the Forest Service is doing some belt tightening these days and not many of us have money to throw around. CTHA is committed to the future of our horse trails in north Georgia and we need your help. Making a donation will help us to continue to maintain existing trails and create new trails for your riding enjoyment. Being a dues paying member of CTHA has quite a few benefits. You get to feel good that you’re making a contribution to trails and at the same time have an opportunity to meet new trail riding buddies and participate in organized riding events. Also, via our email broadcasts, we’ll keep you current on north Georgia horse trail news and issues. Every little bit helps us and the annual $20 fee it costs to be a member is money well spent. If you’re not a current member, please consider joining the club or making a donation. To become a member just download and print our application so you can start enjoying CTHA today. Download the application here. You may need Adobe Acrobat reader. Get it here. If you want pay the dues or make a donation electronically by using PayPal click here.